There are entire stores and clothing lines dedicated to addressing the needs of big and tall men and full figured women. Yet, when it comes to hangers, we unrealistically expect one size to fit all. A former sales manager for Saks Fifth Avenue, Neiman Marcus, and Brooks Brothers, Robin Pulewitz knows a thing or two about presenting and preserving your wardrobe. While overhauling the closet of her boyfriend, Robin realized just how inadequate average hangers were for his sturdy build. She tried some extra large plastic tubular hangers, but found that they didn’t properly support his clothing especially his business suits and heavier items like sports coats and jackets. That’s when she came up with a big idea for plus sized men and women. 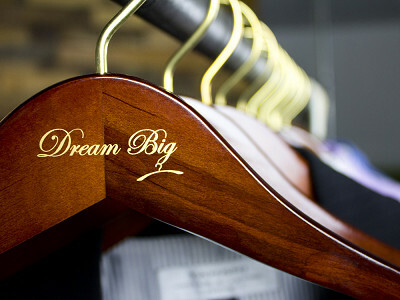 Made of lacquered wood, Dream Big for women and Well Hung for men have a polished look worthy of your finest clothes. Wider dimensions prevent bumps and indents in the shoulder area—a common problem that occurs when standard hangers fall short of the shoulder seams in plus-sized shirts, jackets, sweaters, and dresses. Rubber grips on the top of the hangers prevent garments from slipping off and landing in a heap on the floor. Flocking keeps pants and skirts in place without fold marks. When clothes are hung to perfection, they don’t just look better in your closet, they look better on your body. Hi everyone! 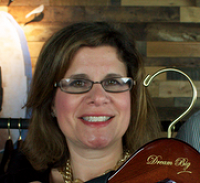 I'm Robin, creator of Well Hung Hangers...for men of substance and Dream Big Hangers... for women with curves. Please feel free to ask any questions! I am so happy to be here. Thanks! You missed a big opportunity when you didn't "show' THE HANGERS' from the side - showing (IF) the shoulders of the hangers are wide, or, are as wide as the body of the hanger. A quality hanger for suits always has a wider shoulder to support the jacket so the hanger won't 'poke' a 'buldge'in the shoulder.' I have a closet full of suit hangers - all - with a WIDE shoulder but would by more if your product had the same design as mine. @Guest Thanks for your question. They just posted another picture so you can see. The Well Hung Suit Hangers are 3/4" of an inch thick and 22" long. Most Big and Tall men's hangers are shorter than 22". All of our other hangers are 1/2" thick. We support shoulder seam to shoulder seam in the length of our hangers and therefore don't need the bulb end. Hope this helps. There are entire stores and clothing lines dedicated to addressing the needs of big and tall men and full figured women. Yet, when it comes to hangers, we unrealistically expect one size to fit all. A former sales manager for Saks Fifth Avenue, Neiman Marcus, and Brooks Brothers, Robin Pulewitz knows a thing or two about presenting and preserving your wardrobe. While overhauling the closet of her boyfriend, Robin realized just how inadequate average hangers were for his sturdy build. She tried some extra large plastic tubular hangers, but found that they didn’t properly support his clothing especially his business suits and heavier items like sports coats and jackets. That’s when she came up with a big idea for plus sized men and women. 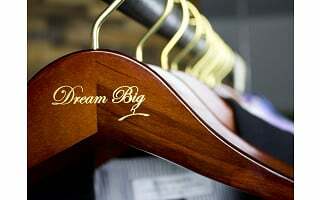 Made of lacquered wood, Dream Big for women and Well Hung for men have a polished look worthy of your finest clothes. Wider dimensions prevent bumps and indents in the shoulder area—a common problem that occurs when standard hangers fall short of the shoulder seams in plus-sized shirts, jackets, sweaters, and dresses. Rubber grips on the top of the hangers prevent garments from slipping off and landing in a heap on the floor. Flocking keeps pants and skirts in place without fold marks.